New Hampshire fall foliage provides some the most picturesque foliage tours in the entire United States. People journey from far and wide to see the beautiful transition of the vibrant colors that light up the trees in this lush state. As a more Northern state, New Hampshire experiences the transition into fall a little earlier than the other New England states. In the northern most tip of the state, the “Great North Woods” region, fall foliage just begins to change colors around the second week in September. By the last week in September this northern region is in peak, while the lower half of the state, the regions of Seacoast and Merrimack, are just beginning to turn. New Hampshire peak foliage season generally occurs around mid October, when the entire state is a sea of autumn colors. Whether your desire is to stroll along at your own pace, or jump on an adventure packed train ride, New Hampshire offers a variety of ways to experience this colorful changing seasons. Either way it’s time to pack your cameras, hop in your cars, and prepare for a whole lot of “oOoing” and “ahhing” as you travel the east coast on your New Hampshire foliage tour. This foliage tour offers you a variety of experiences. Hop in your car and travel up the New Hampshire mountains as you take in the breathtaking skyline and vibrant colors that cover the mountain side. Once you’re ready to hop out of the car, get ready for a refreshing hike up the mountains to the beautiful Arethusa Falls. This waterfall is famous for being the highest single waterfall in New Hampshire at about 176 feet. Here you’ll also enjoy a birds-eye view of Bemis Brook Falls, Fawn Pool and Coliseum Falls. This valley trail takes you on a breath taking 13 mile sightseeing tour of the heart of New Hampshire. Watch the seasons change as you travel along Routes 16, 125, 153, and other local roads from Milton to Wakefield. 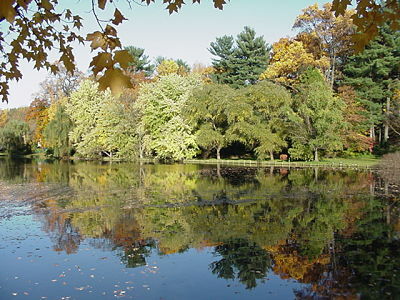 Enjoy the area’s 273 lakes and ponds that nourish the trees and leave the water sparkling with colors. Watch as the trees turn from scarlet red to sunset orange as you make your way through thick woodlands, open pastures, and along rivers and streams. The Winnipesaukee Scenic Railroad offers Round Trip Fall Foliage Tours from the beginning of September till the end of October. This train ride takes off from Meredith Station, NH and travels along the shore of Lake Winnipesaukee on a two hour adventure tour of New Hampshire. Have your cameras ready as you coast by colorful forests, glistening lakes, and quaint towns. Find this foliage train tour here.